Pimento Berry essential oil has warm, spicy-sweet, clove-like aroma. It is a comforting, warming oil that is especially useful for rheumatism, chest complaints and for treating stress and depression. Pimento Berry essential oil (also known as Allspice oil, Jamaican Pepper and Pimenta) is steam distilled from the fully grown, but unripe, dried, crushed fruits of the Pimenta officinalis tree. The tree is native to the West Indies and South America where the berries are widely used as a culinary spice. The spice has a strong, pungent flavour and aroma that is similar to several spices combined - namely cinnamon, clove, ginger, nutmeg and black pepper - hence why it is commonly known as 'Allspice'. Pimento was traditionally used as an embalming agent, as well as for flavouring chocolate and curing and preserving meats. Russian soldiers also put it in their boots during the Napoleonic War to help keep their feet warm and to mask odours. Today it is still commonly used for cooking, for fragrancing men's toiletries and flavouring liqueurs such as Benedictine and Chartreuse. Pimento essential oil has a lovely warming effect on the body but isn’t quite as fiery as some of the other spice oils. When used in small quantities it produces a lovely, gradual, warming sensation that can be particularly soothing for aches, pains and tension (especially those caused by the cold). It can also be helpful for soothing the emotions, relieving fatigue and helping with digestive and respiratory ailments. Use in small amounts and dilute well as it can irritate the skin and mucous membranes. 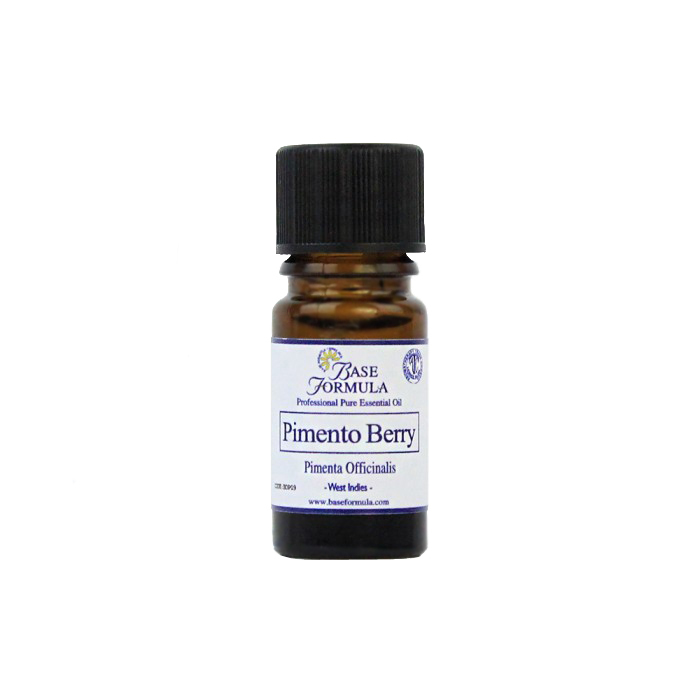 Pimento Berry essential oil has a warming effect on the emotions. It can be helpful for stress-related disorders, depression, nervous tension and exhaustion. Pimento Berry essential oil also has a warming effect on the muscles and joints and can help relieve the pain and tension associated with muscular cramps, spasms, arthritis and rheumatism. It is has a tonic effect on the digestive system and can aid digestion, flatulence, stomach cramps and nausea. It is also beneficial for respiratory problems such as coughs, bronchitis and chills. Bergamot, Cinnamon, Clove, Geranium, Ginger, Juniperberry, Mandarin, Orange, Patchouli, Tangerine.